8 Limbs Yoga | Why Yin? Our whole body is filled with connective tissue, connecting muscle to muscle, muscle to bone, even between our organs. But it is mostly recognized in our joints, where it is most concentrated. We do a lot to protect our joints when we exercise, checking our alignment and using our muscles to take on the weight of our bodies in motion. Exercise and most yoga classes are yang practices, focused on using muscular heat and strength, which is important. Strong muscles (not necessarily the Popeye type) are good for a myriad of reasons that culminate into overall health. For optimal health, a Yin practice, such as meditation or Yin yoga will take us to a level of health that encompasses the mind, body and breath awareness. Yin Yoga focuses on stressing our connective tissues, mainly in our joints. When we exercise we are stressing our muscles to make them stronger. Yin yoga stresses the connective tissues in our joints to maintain elasticity. Yang tissues (muscles) respond to heat through our circulation and by weight resistance. Yin tissues (fascia, ligaments, bones) respond to slow, cool pressure. Think of your teeth getting braces, that’s a yin practice. The pressure of the braces slowly aligns your teeth. We’re not going to change your skeletal structure in Yin yoga but we are going to hold poses with relaxed muscles long enough that your body is going to respond by bringing energy or chi into the targeted area, hopefully creating joint flexibility. The yin tissues become “ longer and stronger-which is exactly what you want. Yin yoga is arguably a more mindful practice than it’s Yang counterpart. Poses are held for three to five minutes giving us the opportunity to really ‘sit’ in the pose (usually held 3-5 minutes) and surrender our mind to the moment. It’s a gateway to meditation practice, if you don’t have one already. So why do I practice Yin? Because I want my joints to stay fluid, like the rest of my body that I work so well in Yang practices. Because I like the way it strengthens my concentration skills by allowing me to focus deeply in my poses. And simply, because it feels really good to relax my body and be in the moment. I encourage you try Yin a few times to see how it feels in your joints and body, and also how your mind sits with the stillness of the practice. Karen teaches weekly Yin classes at 8 Limbs Wedgwood on Mondays at 4pm. She will offer her annual Yin Yoga Workshop this Sunday at 1:00pm, also at 8 Limbs Wedgwood. Register now! 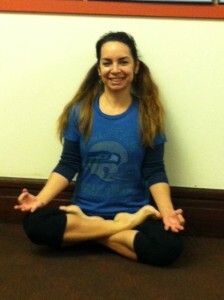 Read Karen’s Seahawks Blog from January 21.